It’s the end of the year, so I’m going to clear out some blog drafts, snippets of writing, going back a bit over a year. If the Great Australian Dream is home ownership, preferably a quarter-acre block with a huge backyard, then the Great Australian Transport Dream might be free-flowing traffic everywhere you go, and a car spot right out the front of wherever you’re visiting. Both dreams are dying, because they depend on space which is no longer available as our cities continue to grow. In fact arguably if you want either or both of these, you need to move to the country, to a town or smaller city. And yet our politicians still believe the latter is achievable. Australia and the USA are perhaps the only places around the world where the illusion of sufficient road capacity for free-flowing traffic still persists. Perhaps the enticing hints of it that you see at night or early morning are what provides the illusion that it might still be achievable. It’s not. Most people prefer to drive? Well of course they do! Investment since 1930 has been heavily skewed towards roads. Just look at how many railway stations opened between 1930 and 2010. Most services are infrequent. Even on the train network, many lines run only every 20 to 40 minutes on Sundays, for instance. Buses are even worse. Mostly hourly on weekends, and only every half-hour on weekdays – even in peak. In fact, have you noticed how the train network (including V/Line) is moving towards a 10/20/40 minute frequency, but most buses are every 30/60 minutes? No wonder the timetables aren’t synched! We’ve got the bones of a good network. The infrastructure isn’t perfect, but there’s plenty of capacity outside peak times: track capacity, fleet, bus bays/stops/zones. The opening of the rail extension to Mernda triggered a range of timetable changes on trains and buses around Melbourne. This follows on from train timetable changes last year on the Craigieburn and Sunbury lines, and tram timetable changes earlier this year. PTV has a page summarising the changes which is worth a look. Dandenong Corridor passengers will benefit from up to 80 new and extended services each week and a longer turn-up-and-go service frequency in the evenings, meaning trains every 10 minutes until 10pm on weeknights. Most people would take that to mean that the trains are every 10 minutes until 10pm from the city. In fact it’s until 9:33pm, then drop to every 20 minutes until about 10:30pm, then every half-hour. Undeniably it’s progress — previously the 10 minute service finished at 8:22pm. But it’s not quite what was implied. Thirty-five new weekday services will also be added on the Werribee Line, and passengers at South Kensington, Seddon, Yarraville and Spotswood can catch a turn up and go service until 8.20pm on weekdays. The principle of changing bus timetables when train timetables change is good one. In some areas, work has been done to align connections. This helps explain why some bus routes run every 20 or 40 minutes, in areas with trains every 20 minutes. PTV: From Sunday 26 August, a number of bus timetables will change to keep them connected with new train timetables on the Werribee, Hurstbridge, Cranbourne, Pakenham and South Morang/Mernda lines. I noticed one of the routes that’s changing is local to me, the 701. So I took a look at the new timetable. Saturday night 701 buses depart Oakleigh: 7:05, 8:11, 9:11. This appears to align with trains arriving 6:56, 8:06, 9:06. Sun night 7:16, 8:16, 9:16, trains arrive 7:06, 8:06, 9:06. Seems okay (though connections at the other end of the route at Bentleigh are less good). I started writing this during the state election campaign. The Coalition campaigned strongly on crime, and even claimed Labor had cut police numbers in some areas, including Glen Eira. Labor claimed the opposite. Is there actually a crime wave? Are home invasions up? The Crime Statistics Agency says that overall crime was falling from 2008-2011, then headed upwards, peaking in 2016, but it’s dropped again in 2017 — hopefully the start of an ongoing trend. But Residential Aggravated Burglary is way up — almost doubling from 2008 to 2017. Local area figures for Glen Eira show this trend as well. So there is some truth that some types of crime are increasing, while the overall crime rate seems to be dropping. The problem with the stats vs the rhetoric is it’s often a bit hard to pin something like this directly onto either side of politics. And not very helpful of course. Bear in mind that the rate of recorded criminal incidents could go up as a result of better reporting. For instance we know that recorded offences rose over the period that Protective Service Officers were deployed onto railway stations. I’m not sure that would be the case for aggravated burglary though. What about police numbers? Are they going up, or being cut? The claims above can’t both be right. Victoria Police employee numbers for June 2018 show a total of 14,476 Police Officers (Full-Time Equivalents) — this excludes 1,365 PSOs. In Glen Eira there are 93 police plus 8 public servants = 101 total. The December 2014 figures showed a total of 13,135 Police Officers. In Glen Eira: 98 total (no breakdown). So to me, it looks like both are up, though not by very much in Glen Eira. And it doesn’t seem unreasonable to deploy most new officers to other, growing suburbs. In my experience, politicians don’t usually lie. But they often do selectively cherry-pick statistics, and bend the truth. Usually somewhere in the stats, there’s some basis, however tenuous, for a claim. Is fear-mongering on crime even a good political strategy in a relatively safe area? It might work in the areas that actually have big issues with crime, but I know some locals in my area who are entirely unconvinced by this. I think my hunch proved right. The Vic Coalition’s 2018 election strategy was a flop. North East Link’s latest costing is now an eye-watering $16 billion. November 2017: Airport rail plan starting to move. It’ll still run via Sunshine/Albion, but importantly there’s been a change of strategy: the latest thinking is making it part of a wider network upgrade that includes more separation of regional and suburban lines — the latter in the west is facing huge patronage growth due to urban development. And the idea is that the airport service won’t be a dedicated line with no other uses. This is good — as I noted when visiting London recently, specialised point-to-point express trains tend to be expensive and not used by many people. Mind you, have you noticed how both big announcements by politicians about airport rail recently are both completely different from PTV’s “long-term” Network Development Plan? The details are very vague at the moment. It’ll be good to see this plan fleshed out a bit. The reality is that those in the traffic are at a standstill. Sure, it’s very visible. But if handled well, it doesn’t actually affect the majority of people, because most people don’t drive into the CBD. Pedestrians can face congestion, but can mostly keep going – if they’re able to walk around the illegally stopped cars on the crossings. Trams often have some problems while diversions were worked out. 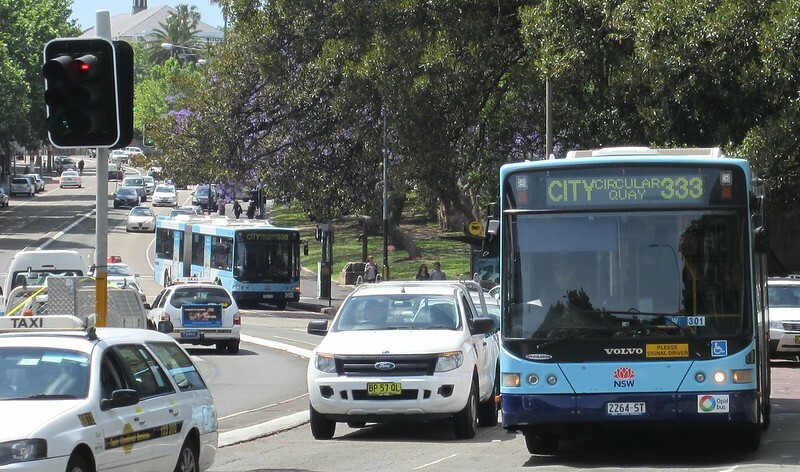 Some bus routes can be affected by the rapid spread of car congestion, though some that are able to use tram lanes (such as across Queensbridge) can keep moving. Trains keep running. In one case I’ve seen reports of cross-CBD car trips taking up to an hour. That’s double the time it takes me by train from Flagstaff to Bentleigh (which of course includes crossing most of the CBD, underground). One report said the police was not naming the location, but… well, it’s very clearly Windsor. After the initial reports from channel 7, news.com.au picked it up. Similar stories appeared in the Irish Independent and the London Evening Standard. I will just note that some of the reporting got a bit muddled. Australia has seen many incidents similar to this in recent times and nobody yet has died as a result, according to Public Transport Users Association spokesman Daniel Bowen. “Platform screen doors are difficult to fit retrospectively, which is why they are being fitted on new lines like the Melbourne Metro for example, but not on existing stations,” he told Channel 7. What I actually said was that there had been incidents of prams falling onto tracks, but no deaths. I’m not actually sure if there have been fatalities due to incidents like this one. Oh, and all those comments were made to news.com.au, not Channel 7. How much money is handed over to provide ads on public transport vehicles and shelters? Quite a bit, though most pricing is not readily available in public. Here’s on deal from 2017 – it seems to refer to a bus stop shelter ad: $168/week +GST (minimum 34 weeks) – that’s about $9500 per year. Another price I found a while ago was ads on the back of a bus: $521 per week. No wonder operators love that supremely annoying all-over-advertising. It must bring in a fortune. Noting that the most-viewed and commented-upon blog posts of last year were all transport-related (yeah this blog has moved to mostly transport in the past few years), I’m wondering what topics people might be interested in for posts this year. I have a number already in the works, but if you’d like to nominate a topic, please leave a comment. Maybe a few posts about what the biggest influences on making PT better we’re/are in Melb, Australia, and international contexts (with parallels?) And both local, regional and intercity contexts? Enhancing #myki with smartphone apps. Exploiting NPP. What’s the best practice from around the world? One last post of miscellaneous stuff to mark the end of 2017. My Grandad was born on this day in 1924. He passed away on Boxing Day, just shy of his 93rd birthday. Being one of our UK relatives, we didn’t visit him much, but we did manage to see him during our UK trip this year. RIP. Total blog posts for 2017: 120 excluding this one. Total comments for 2017: 1276 up to 6pm. 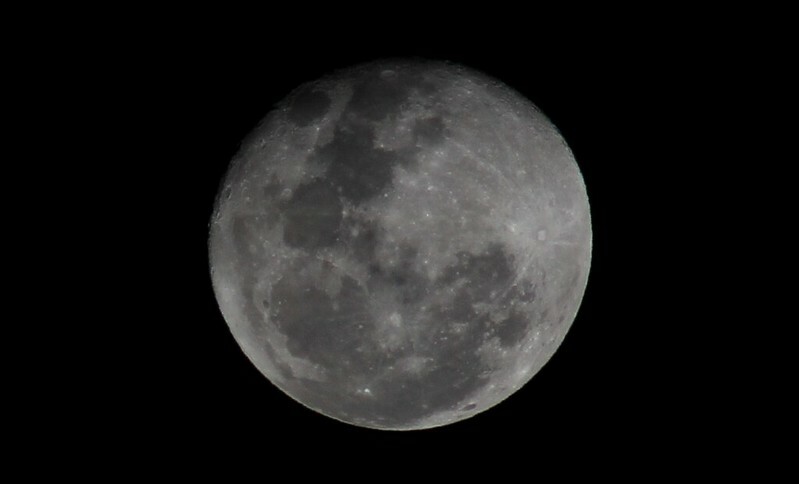 It requires a bit of fiddling to get good photos of the moon. This page summarises what’s needed: manual mode, of course, ISO 100, aperture f/11, shutter speed 1/125. My first go isn’t bad, but doesn’t show the detail of professional shots. One of these days I’ll buy myself a better zoom lens and try it again. Not much to report. Breakfast at Darlinghurst’s Jekyll & Hyde — which was a bit meh. M’s order came with unwanted eggs, which I adopted. Afterwards I realised it was one of the breakfast places I’d ruled out because some of its Urbanspoon reviews didn’t sound that great (though it had a respectable score of 89). I’d happily go back to The Bunker or The Royal, but not this one. After that, packed up, got a taxi to the airport (M had a Cabcharge). The traffic was okay, though going the other way it was jammed up due to a crash. Got to the airport in plenty of time. 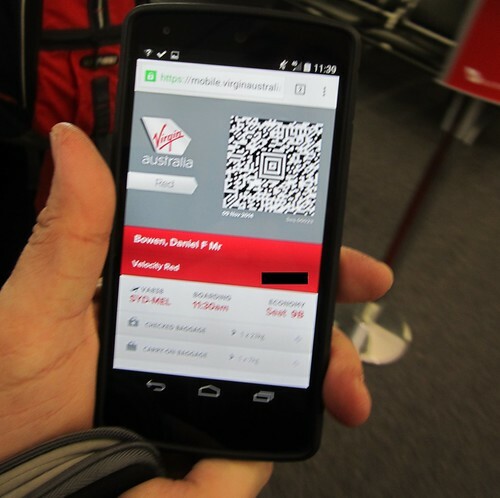 Checked-in the night before online, and used a boarding pass on my phone for the first time. 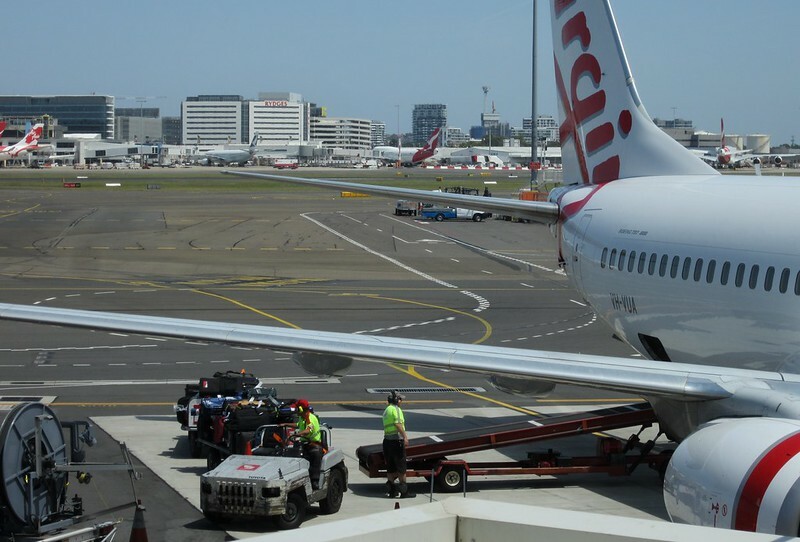 Flight and Skybus/train back was uneventful (though I must remember to walk to the Qantas Skybus stop in future to save time) — back home by mid-afternoon Sunday. Long-term blog readers would know I’ve taken a few short 4-5 day breaks over the years. I quite like that style of holiday. You’re not going to see everything, but you’ll get a good taste of a place without having to organise things like laundry. I like having a few things planned each day, but nothing absolutely essential, and the flexibility to change things around — add stuff if you find there’s extra time, skip things if it feels rushed. I’m also a fan of the centrally located hotel. It’s good to have a base that’s close to the action, making it easy to stop back past there during the day if desired. Walking distance to a supermarket and cafes/restaurants is also a great thing for breakfast and dinner. Hotel breakfasts are often an option, but generally quite expensive compared to a local cafe. In our case, this time the hotel wasn’t right in the CBD ($$$), but a very short walk from a nearby railway station that has frequent services — every 10-15 minutes every day until midnight — and as often as every 3 minutes in peak hour. The trains have impressive capacity. They never seemed too crowded, though our use was mostly outside peak hour, and I did see other trains passing that looked pretty packed. (It’s unclear if double-deck trains overall can carry more people, due to generally slower dwell times — see this ABC Fact Check article). The rail network as a whole seems very staff-heavy compared to Melbourne. Guards on trains, and on one platform at Central in peak hour I counted about a dozen staff… to assist with boarding? It’s a shame the City Circle direction isn’t shown on train maps. That would have saved me some time. The buses are extensive, and at least in the inner-city, are impressively frequent. But as noted, they often duplicate train routes, and at key locations such as Bondi Beach, are clearly inadequate for the task they’re given. The ferries were a lot of fun, and quite practical given the geography (the same reason they don’t really suit Melbourne) though I suspect some routes are much more economically viable than others. The new(ish) numbering of all modes and routes is interesting, and makes it much clearer when trying to remember which route you have to take, rather than memorising a lengthy line name (eg line T4, rather than the Eastern Suburbs & Illawarra Line). At present there’s still a fair bit of confusion with inconsistent signage though. And it does result in some slightly confusing overlaps with F being used for ferries and freeways, and T being used for trains and airport terminals. It’s all about context I suppose, though a sign mentioning T1 and T3 at the airport that appeared to be pointing down to the trains threw me momentarily. Airport rail is terrifically convenient, thanks to it being fast and frequent. It’s expensive given the surcharge, but even at that near-exhorbitant price, I’d rather have it than not. Being able to get to a major destination such as the airport without being at the mercy of traffic is a godsend. The monorail is gone. I used to ride it as a visitor, but honestly, can’t say I miss it, and nor do I suspect does most of Sydney. I really enjoyed Sydney… again. Can’t wait to go back!